We've got our monthly Q&A and Discussion online session coming up later on today - from 5-6 PM Central Time. Everybody is welcome to log in and participate in the session! These online sessions - which I've been conducting for several years now - are one of the activities underwritten by the generous support of my Patreon backers. 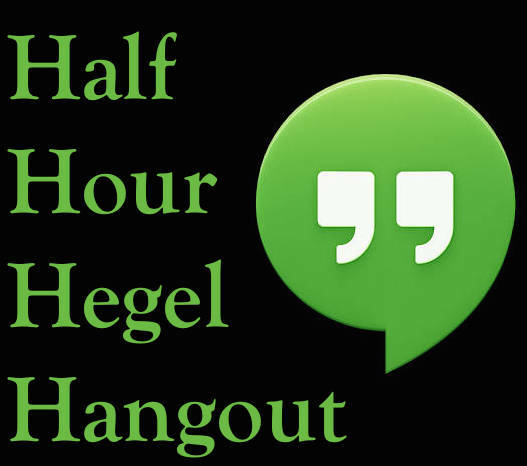 These are people who consider this Half Hour Hegel series project so valuable that they pledge a monetary amount of their choice for each video that I complete in the series. Quite frankly, without their support, I would not be able to devote the time I do to each of the now more-than-200 videos in the series. If you'd like to participate in the session today, you'll want to visit our ReasonIO Wall in FreeConferenceCall.com. If you haven't used it before, you'll need to download a bit of software - but then you're in. See you later on today!